About four years ago, an announcement was made that a new “WebTV channel” was being created to help retailers be more successful. This idea evolved into a web site rich in streaming video clips on many different topics of interest to small business owners. The Gift and Home Channel site also featured a number of weekly blogs — including this one, which debuted as “The Savvy Shopkeeper” in 2008. The Gift and Home Channel was part of Far Countries, a wholesale B-to-B site founded in the year 2000, and both unfortunately folded in 2009. Their assets were purchased this summer by the OLB Group, an e-commerce service provider that helps businesses sell products over the internet. Founder Ronny Yakov, who owned design and production studios in Israel prior to coming to the U.S., has brought back the wholesale aspect of Far Countries under the name GHM Connect. This part of the business has already attracted suppliers such as Zrike, North American Bear and Kurt Adler. 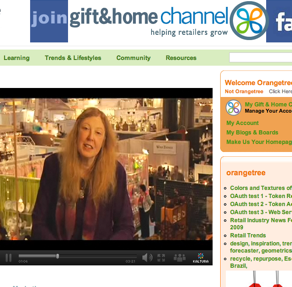 If you visit the GHM Connect home page, you will see a button on the right for the Gift & Home Channel Beta. Registration may or may not be required to visit the site, but it is fairly painless. What you will gain by registering is access to the wealth of blogs, articles and especially the hundreds of short videos (described in this interview with Leslie Nathan Street, former president of the Gift and Home Channel) that many specialists and seasoned retailers — myself included — recorded for the Gift & Home Channel. Just look for these under GHC TV,where you’ll find a drop-down menu for All Videos. The Gift & Home Channel was deserted for a couple of years, and squatters have moved into the blog sections. Let’s hope that the new owners soon are able to clear out entries such as “For Men, Especially Lazy Men” and “Women’s Positions in the 17th Century.” Not that they don’t make interesting reading! I’m sure that the OLB Group will come forward with exciting ideas for growing and developing the Gift and Home Channel as a resource for retailers. But in the meantime. I can guarantee that you will find articles, blog entries and video footage that you haven’t seen yet — or at least not recently — on many topics that will help your business be more successful.